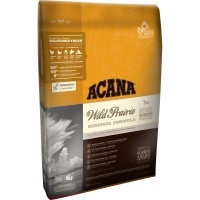 Acana dog food is an extremely high quality complete food for dogs. Made with all fresh regional ingredients, it contains only the best natural products from Canada. High in protein, Acana dog food is easy to digest and perfect for dogs with sensitive digestions. 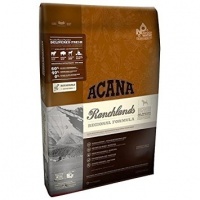 With ingredients such as free-range chicken and lamb, fresh salmon and herring and wild bison, there are very few foods that can match the natural quality of Acana dog food. The grain-free range includes Acana Wild Prairie (with free range chicken, whitefish and eggs), Acana Pacifica (with wild-caught salmon, flounder and herring) and Grasslands (with free-range lamb, duck, whitefish and eggs). Also now available are Acana Chicken and Burbank Potato, Lamb and Okanagan Apple, Classic Red, Prairie Poultry, Yorkshire Pork and the new Acana Large Breed and Large Breed Puppy foods. 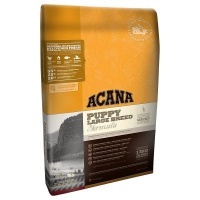 Buy Acana dog food at some of the cheapest prices online with free delivery.